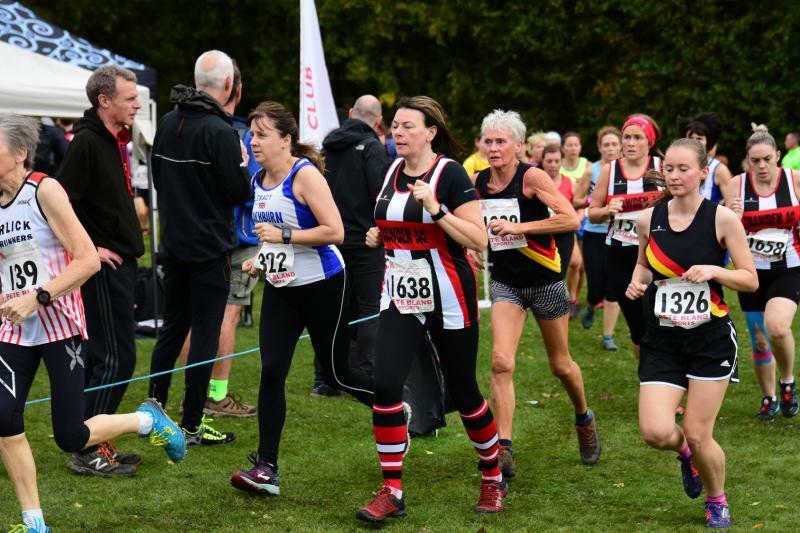 Saturday 13th October saw the start of this year's cross country season with the opening races for both Red Rose and Mid Lancs leagues. Four years after my first outing in stripes, and a few months' worth of encouragement from Alex, I headed back to the race where I started on my journey with Team TAC. On arrival I was greeted by many smiling faces and headed to captain Paula for my number. I then spent the next 10-15mins (no exaggeration) getting my number perfectly parallel to the stripes on my vest, to say I’m a little OCD when it comes to things being straight would be an understatement. I spent the next hour or so cheering on our juniors as they absolutely smashed it, doing the club proud. After a few "I don't wanna do this" moments the time came to head to the start line, and off we went, my only aim was to start and finish. I set off with my XC buddy Alex and we were away. After the first little lap of the field (literally like the tiniest lap of the tiniest field) I had a bit of a blip and told Al I needed to go to my car and she was like "What now? No you don’t, come on!" So I gave my head a wobble and off onto the medium lap we went. Unfortunately, it was part way through that medium lap my back began to tighten, but determined to achieve what I set out to do, I kept pushing. Heading back past the TAC gazebo I turned the corner to hear a familiar little but very loud voice chanting "Auntie Anne, Auntie Anne, Auntie Anne!" and with little Lola-Mae’s voice in my head that was it, there was no way I wasn’t finishing this race. All around the course there were members of Team TAC giving much needed encouragement and support. With gritted teeth I pushed on, by this point I was having to put pressure on my lower back to stay upright but I was pushing on and despite the pain I actually felt great! Weird I know. I was back in my stripes with the TAC family, I was running again, and it was cross country, what more could you want of a Saturday afternoon? I came to the final corner before the finish and began the mass of cheers of "Come on Anne!" Team TAC at its finest and with that I set off for a sprint finish, not my usual crazy ugly face kinda sprint finish, but a sprint finish nonetheless. When I came to a stop my back went into spasm, as I made it to the end of the finish tunnel and hit the floor, I was surrounded by the best extended family a girl could ask for, that and a handy sports therapist that gave me immediate treatment whilst Alex translated my mumbles to said therapist. Not only that but I had my lil' Ruby who ran and got a coat to put over me, stuck a Crunchie under my nose and said "Here, eat some chocolate" and offered me a drink. Alex and Nicola got me to my feet and we headed back to the gazebo a little wobbly but just about in one piece. Back at the gazebo whilst stretching out my back, Zoe went on the hunt for painkillers and I had Nicola and Trudi offering to rub my back (one of them did but not sure which as I had my face in the mud). So, let's just say my first race back was a little interesting, lol! Although being in a field surrounded by people, on my knees with my vest pulled up whilst some random man ran his hands up and down my spine wasn’t exactly how I thought my race would end, I am very happy! I aimed to start and finish and that is what I did, and it wasn’t actually the slowest I’ve ever ran that race. I’d like to a say big thank you to all those that helped and checked I was okay with extra special thanks to Alex and Nicola. So glad to be back in the TAC fold, bring on the next one!